I could probably eat avocado toast every day and not get sick of it. That’s saying a lot because I get bored of eating the same thing over and over. So what do we have here? 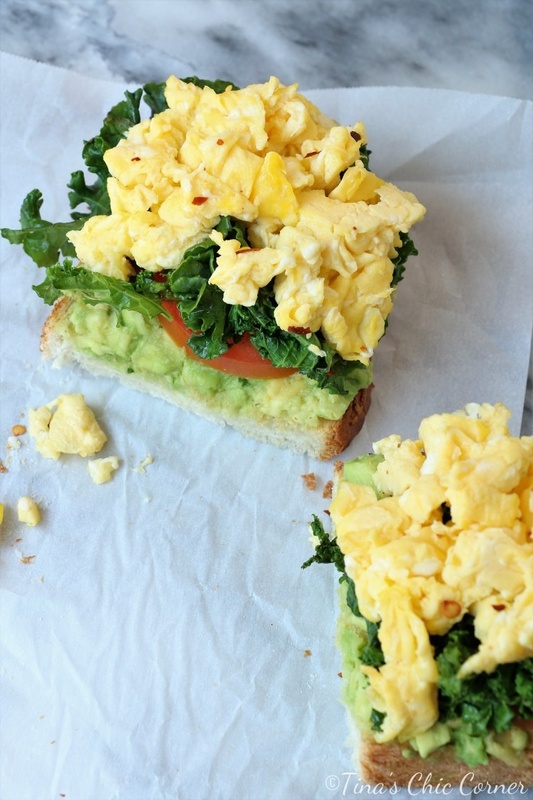 We’ve got toast, avocado, tomatoes, kale and scrambled eggs. It’s simple and healthy which is what I’m into lately. I know that not everyone is into kale so feel free to swap it out for something that you like. Spinach is a great substitute for kale. I love it when healthy food looks this appetizing. It inspires me to eat more healthy foods. In a skillet, over medium heat, grease the pan. I use cooking spray. Place the kale in the hot skillet, season it with salt and pepper, and cook it until it’s wilted. Remove the cooked kale to a dish. Place the same skillet back on the stove, lower the heat to low, and spray the pan again with the cooking spray. Pour the eggs into the hot skillet, stir constantly and cook it until it’s done to your liking. Toast the slice of bread. You can use any kind you like. Place the toasted bread on a plate. 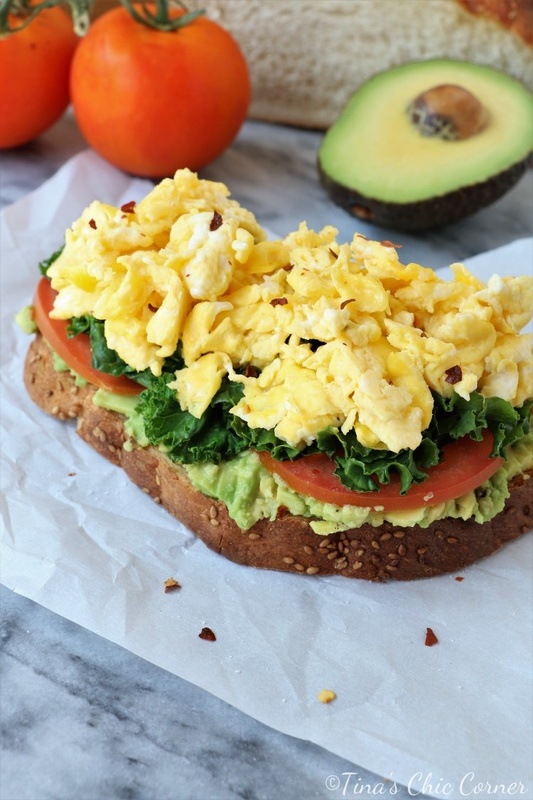 Smash and spread the avocado on top of the bread. Place the tomato slices on top of the avocado. Place the cooked kale on top of the tomatoes. 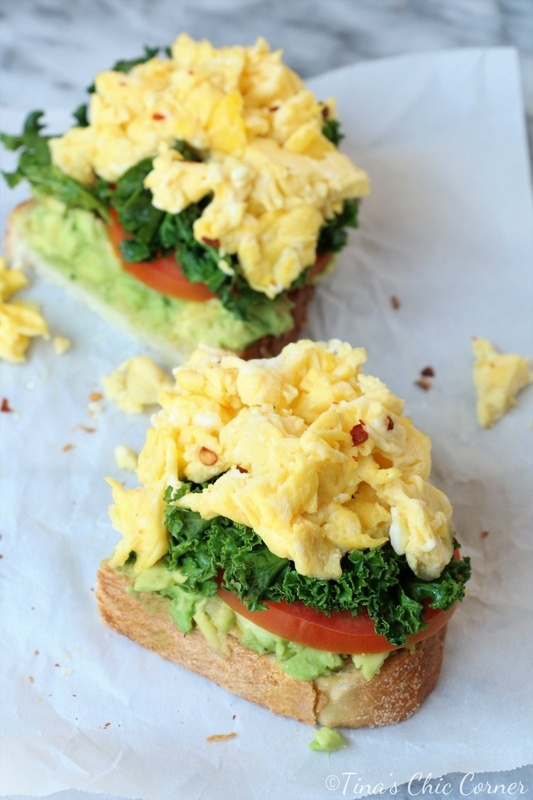 Place the scrambled eggs on top of the kale. To add a bit of heat, sprinkle a little bit of red pepper flakes on top. If you’re not in to spicy, just leave these out.